Abstract. The modification of the matrix method for constructing the displacement field on the free surface of an anisotropic layered medium is presented. The source of seismic waves is modelled by a randomly oriented force and seismic tensor. A trial and error method is presented for solving the inverse problem of determining parameters of the earthquake source. A number of analytical and numerical approaches to determining the earthquake source parameters, based on the direct problem solutions, are proposed. The focal mechanisms for the events in the Carpathian region of Ukraine are determined by the graphical method. 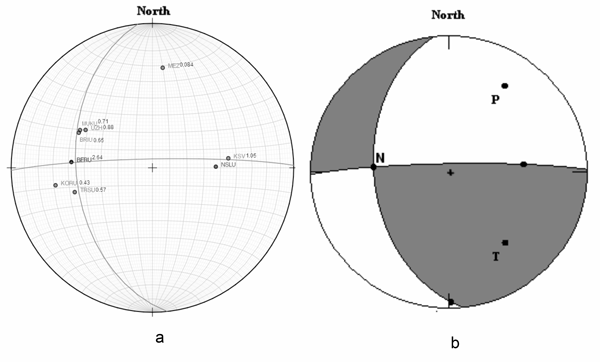 The theory of determination of the angles of orientation of the fault plane and the earthquake's focal mechanism are presented. 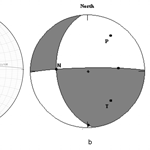 The focal mechanisms obtained by two different methods are compared. How to cite: Pavlova, A., Hrytsai, O., and Malytskyy, D.: Determining the focal mechanisms of the events in the Carpathian region of Ukraine, Geosci. Instrum. Method. Data Syst., 3, 229-239, https://doi.org/10.5194/gi-3-229-2014, 2014.